We are a leading Service Provider of hayatt wooden kitchen cabinets and hayatt modular kitchen cabinets from New Delhi, India. 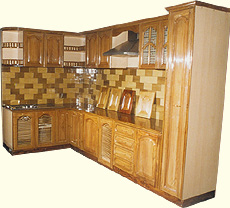 We are manufacturer of Hayatt Wooden Kitchen Cabinets. Hayatt Wooden Kitchen Cabinets offeredfeature flawless smooth designs as well as use of seasoned chemically treated wood which provides for smooth crafted finish as well as long lasting usage support. Further, our expertise lies in making these exclusive range of designer kitchen cabinets in various styles, finish and design options to pick from. Some of its features include reflect excellent craftsmanship standards as desired by customers, finely carved and crafted finish, matching up to the tastes of customers. Hayatt Modular Kitchen Cabinets offered are highly demanded to be used in modern kitchen spaces as well as support the need of providing enhanced aesthetic values to the kitchen interiors. Here, our expertise lies in offering the end solutions using quality materials as well as with features like superior durability and cost effective usage, thus providing for perfect kitchen setting as well as provide for easy to handle usage value. Looking for Wooden Kitchen Cabinets ?